Welcome to Day 4 of Papertrey Ink's November release countdown, and our second of three big group posts for this release. Today we are featuring Wrap It Up, designed by Nichole Heady, which is a fun and clever die set for making wrapped gift die-cut. 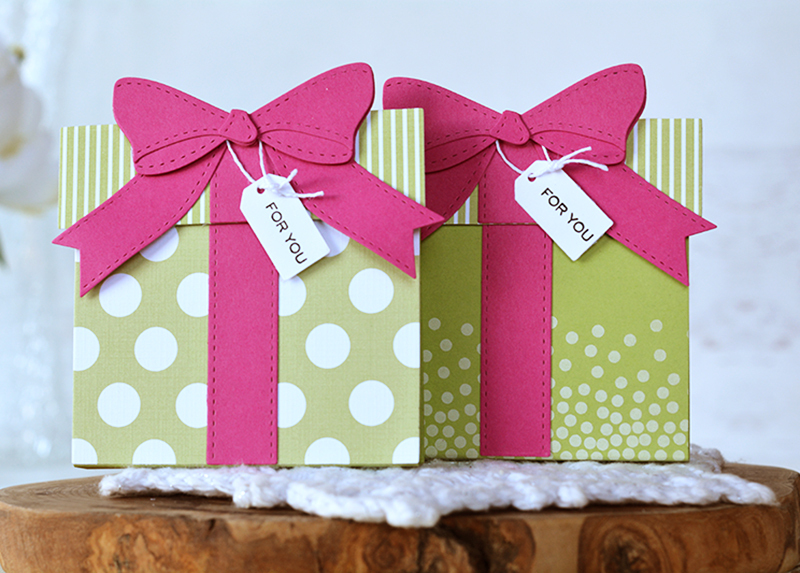 Use these on cards, tags, and wraps for any gift-giving occasion. Also, if you fell in love with Lizzie Jones's Christmas Cuts tags last month you'll be thrilled this month's birthday (and other occasions) version called For You. All of the new products will be available at 10 pm ET on November 15 in the Papertrey Ink store. My first project is a coordinating card and tag, both featuring Lizzie's For You collection. I started with the birthday candles For You die-cut in white, then layered another white Window Cut Tag on top. I know many of us are happy to see the Window Cut Tag! There's also a solid version of the tag shape coming out this month called Basic Cut Tag. This will be perfect if you want to add a backer layer behind the window (for shakers, for example). 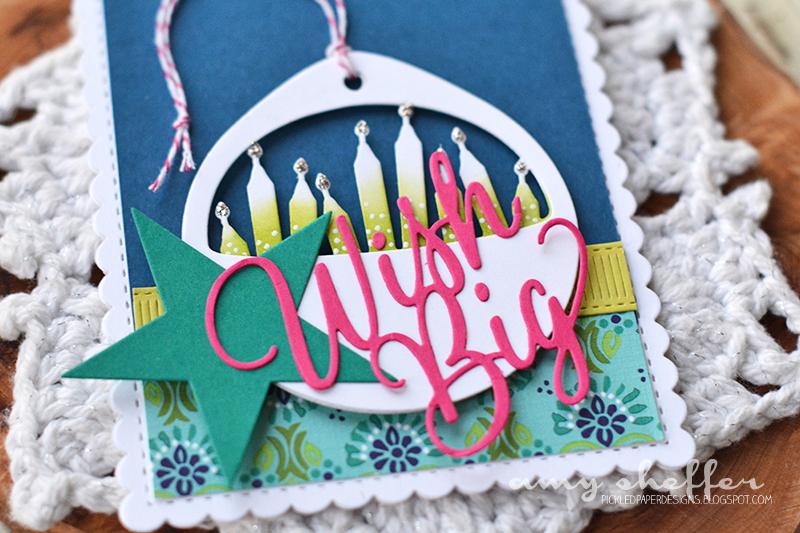 To my birthday candles tag, I added a large Tropical Teal star and the word die-cut Big Basics: Wish Big. 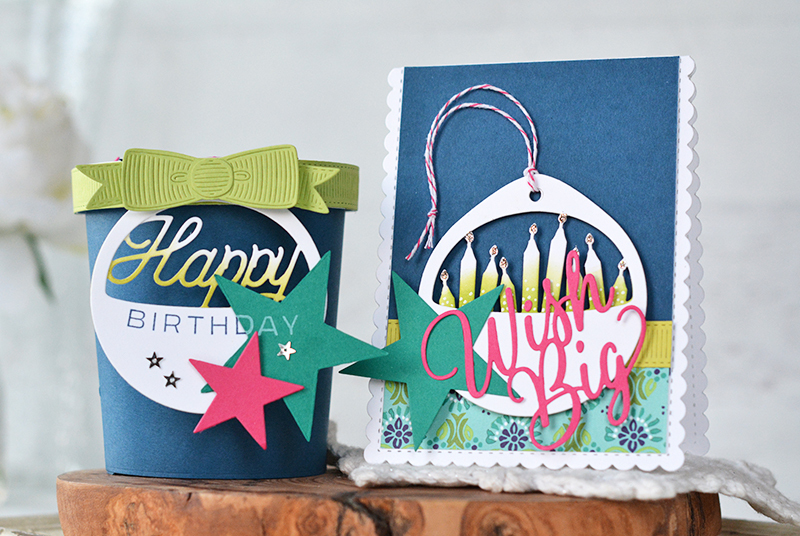 Also, for the card base, I've used the new Noted: Scalloped A2 Vertical die set. Love this one, too! The tag on the pint container was done in a similar way. The back layer is the For You tag with the word "happy." 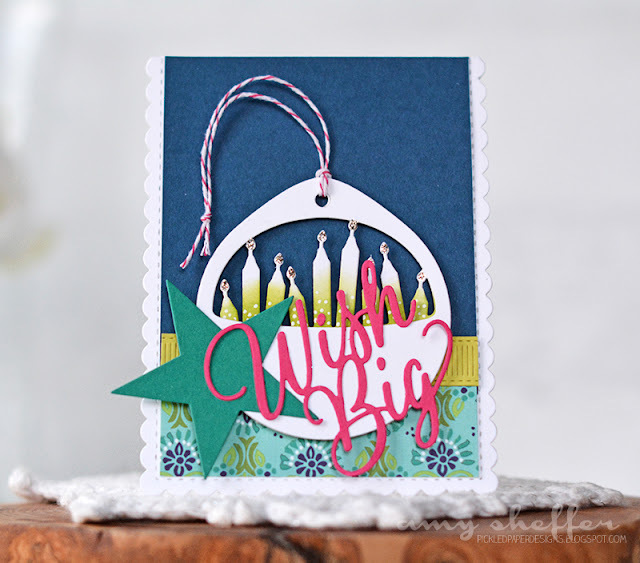 The top layer is the Window Cut Tag, which I've stamped with a For You birthday stamp. I added some die-cut stars as well as some star sequins to finish. 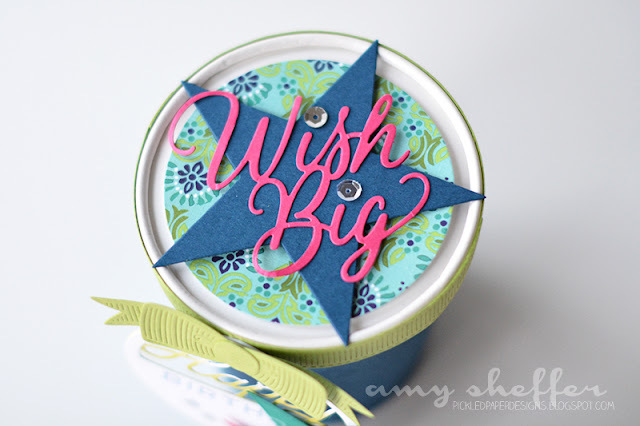 Around the band of the lid, I've used Erin's Simple Gift Bow dies from last month, and on the lid, I've picked up some design elements from the card -- the patterned paper and the Raspberry Fizz Big Basics: Wish Big die-cut. 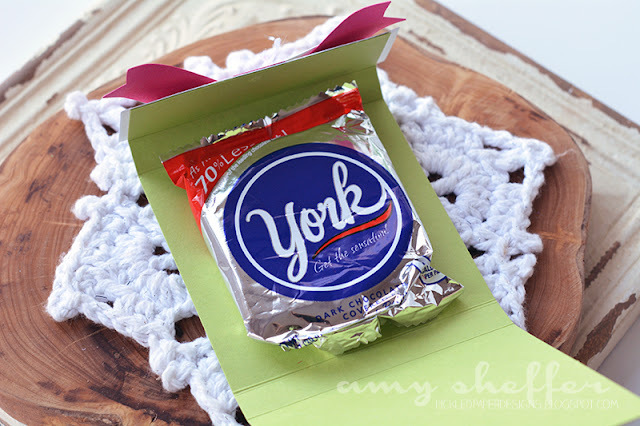 And last is a fun and super quick party favor idea using the Wrap It Up dies. Pull down on the box flap and your contents are inside. The nice thing (other than cheap and easy)is you can adjust the depth for whatever item you're giving. For these peppermint patties, my wrap is 3 5/8" wide x 9 1/8 long. I scored at 3 1/2", 4", 7 1/2", and 8" then added the gift box die-cut and ribbon length to one end and the the ribbon, bow, and box top to the other. 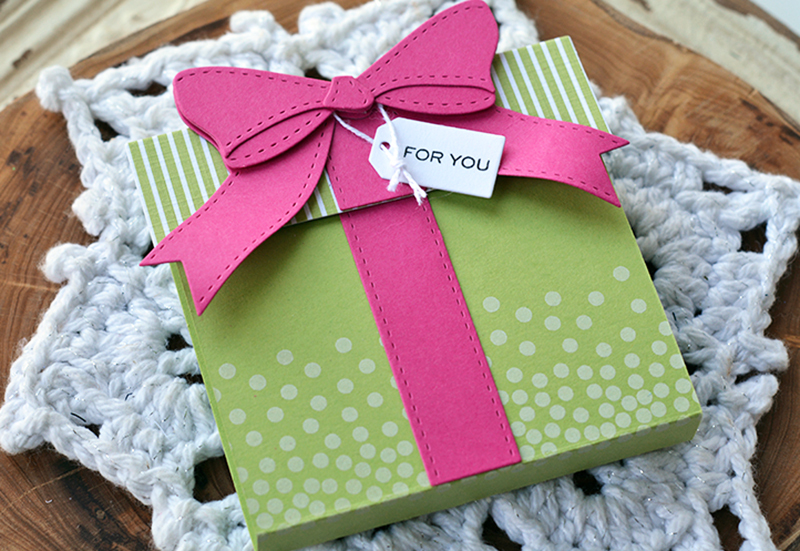 I also added the darling gift tag de-cuts. Fabulous projects. Those little treat packages are too cute for words. The Christmas Cuts Tag dies are awesome. I just LOVE you birthday candle tag. Your projects are too cute for words. May I ask where you got the pint container or is it a recycled container? 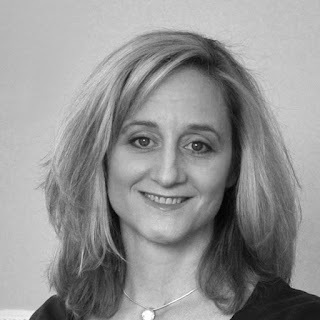 Thanks for such great inspiration!!! Oh these are amazing!! I LOVE what you did with the pint container!!! I so need that ribbon die!! Absolutely love your projects! I especially love the treat holder. It would be perfect year round. I would love to try it for our church Spring craft sale with something for Easter. Amy, your projects are adorable. 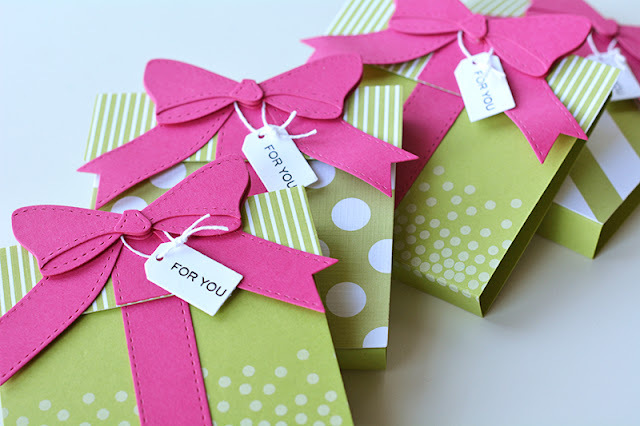 Love your color choices, and your party favors in a box are fabulous. Amy, I know your daughter's party was a hit with the cute mint patty holders. 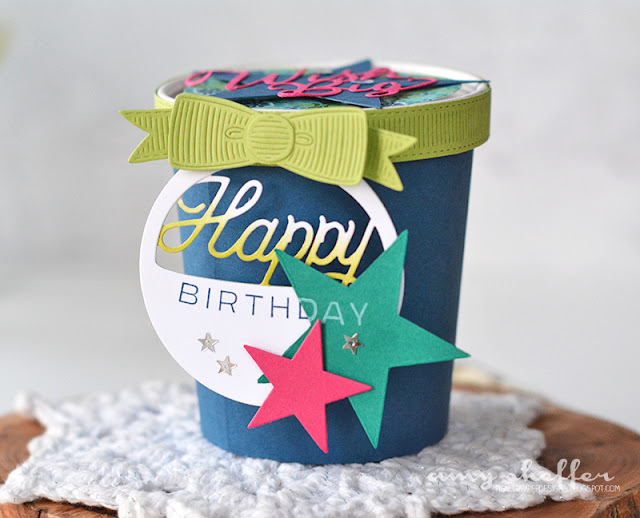 The birthday card and container are great also. 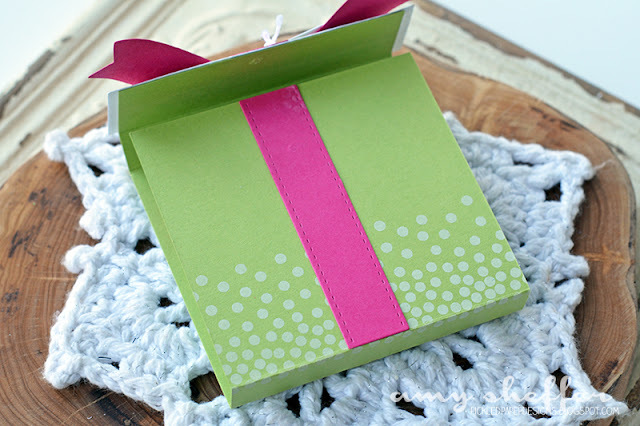 LOVE that project using the wrap it up die. So clever and cute!!! 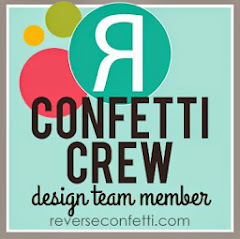 Colorful, Delectable, Adorable Projects to feast our eyes on!